In all areas of spray nozzle engineering, manufacturing, and application, BETE Industrial Spray Nozzles is a pioneer. Ever since 1950 when John BETE invented the spiral nozzle, their spray nozzle design innovations have gone into deep sea, deep space and everywhere in between. In 1993, they were the first spray nozzle company to have its quality management system registered to ISO 9001. In 2003, they became the first spray nozzle company in the world with a quality management system registered to the demanding ISO 9001:2000 standard. Additionally, in 2009, our quality management system registered to the ISO 9001:2008 standard. With thousands of different spray nozzles available in hundreds of different materials, it’s often hard to know where to start. To simplify your selection process, we have broken them into the different spray patterns. Mist or fog patterns are characterised as having the fluid finely atomised with little or no momentum. A homogeneous fog is produced that will largely be directed by any surrounding air flows rather than by the nozzle itself. There are two design types that produce this pattern: impingement and small orifice. The tank cleaning “pattern” requires fluid to be delivered to the whole area of a vessel that needs cleaning. Typically this means a 360° delivery of fluid. There are 3 basic designs of tank cleaner that will achieve this: rotary jet cleaners for high impact, rotary fan cleaner for medium impact and static cleaners for low impact. 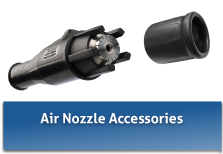 Applications with very specific requirements require specialised nozzles. Nozzles for fire control, spray drying, submerged tank mixing, the paper industry, and air blowoff are some that require application-specific designs.